The Annual General meeting last year was held after the student competition for the Dr John Barnes trophy at Robin Hood Doncaster Sheffield Airport, formerly RAF Finningley. The finalists Luke McKay and Aaron Rodrigo gave excellent presentations and coped well with questions from the audience. Both were rewarded with cash prizes with Luke winning the Trophy for Sheffield University which has been allowed to keep the Trophy permanently as they had won it for the third year in succession. I am particularly grateful to Pauline Chadwick and Airport Director Steve Gill for their most enthusiastic support and the day of events was concluded with a guided tour of the Avro Vulcan XH558 which included access to the cockpit. Her flying display the following season continued to thrill the crowds countrywide. As in past years, our Association was one of the proud sponsors of the annual Multiphysics Conference held Thursday 14th - Friday 15th December in Barcelona. As the Conference Director, I took great delight in overseeing the entire proceedings and the event being brought to a successful conclusion under the presidency of Professor Moji Moatamedi. 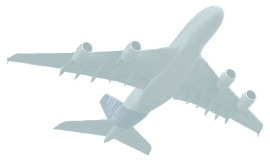 All papers as expected were of a very high standard with many relating to fluid-structure interaction and aeroelasticity. In order to facilitate the younger generation into this relatively new arena, an additional conference for students is being organised during summer next year. I am very grateful to Dr Alex Chong at the University of Glamorgan for brilliantly organising the first day of events in 2012 on Friday 9th March. Professor Steve Wilcox provided a detailed overview of activities at Glamorgan and wide ranging solutions were suggested during the committee meeting in the morning. One of the attendees, Assistant Director - Aerospace from the Department for Business, Innovation & Skills South Central & West Yvonne Ward, ended up playing a greater role than she was expecting which was an unexpected bonus for our Association. Research topics covered during the afternoon included analysis of acoustic signals using wavelet transforms followed by a visit to the campus hangar housing the Jetstream 31 aircraft. After the tea break, the delegates were treated to a tour of the engine maintenance facilities at GE Aviation at Nantgarw by RB211 Operations Leader Jeff Kennelly and Government & Business Relations Leader Rhys Williams. Thanks to that visit, I now have a much better understanding of crack detection using the magnetic-particle inspection method and was startled at the sheer scale of the engine test facility housed inside double-walled concrete monoliths. The silencing is so good that even when tests are conducted at maximum thrust levels, the local residents never complain. The list of customers which included Emirates, Cathay and Singapore Airlines was most impressive but surely the most amusing observation was GE overhauling (non-Trent) RR RB211 engines! I have since had a discourse with Professor Alison McMillan (who was kind enough to accompany us on the tour) concerning the pros and cons of metallic versus Kevlar containment of fan blades. The free annual joint event "Flight Simulation and Universities Seminar" with the Flight Simulation Group (FSG) of the Royal Aeronautical Society (RAeS) was held on Tuesday 3rd April in Amy Johnson Building at the University of Sheffield. After discussing arrangements for the forthcoming Farnborough Air show during the customary committee meeting in the morning, the seminar commenced with the announcement that the RAeS had formed the International Committee for Aviation Training in Extended Envelopes (ICATEE) with particular emphasis on stall recovery procedures and display of angle of attack information to commercial pilots. Chris Hunter FRAeS CEng, Head of Engineering, Thales Training & Simulation gave the first talk which included an overview of recent developments including mass balanced actuators and tackling the lack of viscous damping in pure electric systems. This was followed by presentations from Professor Dave Allerton (Sheffield University), Dominic Diston (Manchester University) and Dr Mark White (Liverpool University). The panel discussion in the concluding stage addressed the future including the theme "how to capture and render highly detailed emergency scenarios" with contributions from Mike Southworth and Dr Steve Hodge from BAE Systems. The day ended with a tour of the laboratory facilities and the engineering flight simulator. I am very thankful to Professor Allerton and FSG Committee Member Barry Tomlinson for organising every aspect of this most productive day. Our Association exhibited at the Farnborough International Air Show and Trade Exhibition again this year thanks to the magnificent efforts of Drs Simon Prince and Andrew Lewis. The stand, which featured one of Dr Ray Wilkinson's rockets from the University of Hertfordshire, was located with many other university stands, in the Innovation Zone which was opened by the Minister for Science and Universities, Mr David Willets MP. The Association participated during "Futures Day" on Friday 13th July, when over 10,000 youngsters attended, and during the weekend public air displays. Those manning the stand were able to provide impartial advice on education choices to a good many interested parties, and it is hoped that the member universities will benefit from this interest and the warm advice provided. No report this year can be complete without a mention of the very sad passing away on the 25th August of a man of countless superlatives in the world of aerospace. Despite his many heroic exploits and display of outstanding leadership in times of crisis, Neil Armstrong was extremely humble, often describing himself as a nerdy engineer. It took a man of his scientific knowledge and physical fitness to stabilise the capsule which began to spin at a dizzying rate during the first ever in-space docking manoeuvre when he commanded Gemini 8. He successfully executed the first landing of an inhabited vehicle on a heavenly body despite the extremely low fuel state and being subjected to repeated computer alarms. Having been an undergraduate and a postgraduate, Neil Armstrong returned to the academia and served as a Professor of Aerospace Engineering at University of Cincinnati from 1971 till 1980. In 1982, he was awarded the well deserved honorary degree of Doctor of Science. 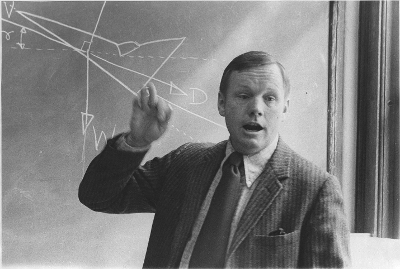 Professor Neil Armstrong explaining the theory of flight mechanics to undergraduates. Reproduced by kind permission of Deb Rieselman, University of Cincinnati Magazine. 26th October marked the first student conference organised by our Association and it was held in the Convocation Suite at City University London. It was opened by the Dean, School of Engineering & Mathematical Sciences Professor Chris Atkin and the finalists were graduates Nathan Arrowsmith (University of Sheffield), Roshain Gaind (City University), Chris Roadaway (University of the West of England), Philip Oates (University of Salford) and Cameron Stewart & Paul Fennessy (both from University of Hertfordshire). All participants coped well with the questions posed at the end of their presentations and were rewarded with cash prizes in addition to being awarded Certificates. I am most grateful to the judges Professor Moji Moatamedi, Dr Mike Jacobs and Dr Mike West for deciding on the overall joint winners Nathan Arrowsmith & Cameron Stewart, postgraduates at City for taking the participants on a conducted tour of the test facilities and especially Dr Simon Prince for making all the domestic arrangements not only for the conference but also for the meetings that followed. Indeed such was the level of success that the committee made a decision to break with tradition and return to City next year for the main event. I am into my second term serving in the Council of the Royal Aeronautical Society and our forging of relationships with the learned societies and industrial partners goes from strength to strength. Governments need to appreciate that all of us who work in the aerospace sector, speak with one voice to ensure a prosperous future which is safe, secure and sustainable (especially in the environmental sense) for all mankind. As always, I would like to emphasise that none of this would have been possible had it not been for the unlimited support I received from the members and the Executive, especially President John Farley OBE for his invaluable guidance & wisdom, Honorary Fellow Dr Mike Jacobs & Vice President Dr Mike West for updating the constitution, Secretary Dr Simon Prince for handling the many administrative tasks, Treasurer Dr Andrew Lewis for excellent stewardship of our Treasury, Dr David Philpott from Engineering Sciences Data Unit (ESDU) for auditing our accounts and Communications Officer Paul Hogan for maintaining our web site. My heartfelt thanks once again to all concerned for continued success of our Association.